For the better part of the last DECADE I have been searching for an actual picture of a 1918 Elgin Black Star Dial Trench Watch. Believe it or not but no actual vintage pictures of this iconic watch have even been found. A friend of mine Dr. Kenneth Larter contacted me with an amazing discovery. He was watching a silent film about the Great War from 1925 called "The Big Parade" a few nights ago and all of the sudden there it was! We are not talking about some fuzzy shot in passing here, this is a full blown closeup wrist shot! There are only two watch cases that were confirmed to have been used by the US Army in 1918. The US Army mil spec was changed in 1918 for wrist watches, but the actual document has never been found, probably lost in time. The cases had to be semi-hermetic and they had to have a black finish. 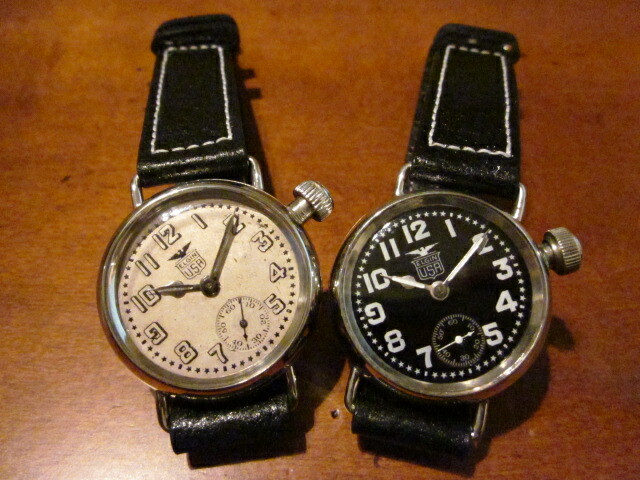 One of them was a case made by the Illinois Watch Case Company, the one with tapered lugs and this is the other one. It is a case that was made by Joseph Fahys & Company in 1918 and it had a nice and wide 16mm lug diameter with a black oxidized finish. Watch the video below and you will understand why the wrist watch was SO important for military operations during WWI. This film is in the public domain now so there are no copyright infringements by posting this video. This is such a treat for me, I'll never be able to thank Dr. Larter enough! Very cool. Thanks for posting the vid. I think they are super. That certainly was a great close up. Awesome find.